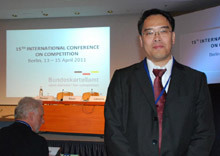 “The one reason for competition and anti-cartel policies is that cartels have one common factor: consumers end up having to pay more for the goods and services that they purchase.” This resonated with Dr. Peter Lee U when he attended the 15th International Conference on Competition in Berlin, Germany. The compelling statement was a reminder from the German Minister of Economy, Hon. Rainer Bruderle, when he extolled competition as the engine of innovation and expressed a desire for an international anti-cartel body or even a world-wide office to police and push for an international anti-cartel law or policy. Operational questions on whether prevention or repression would be the best way to fight cartels were reviewed. Programs that foster voluntary compliance with anti-cartel laws such as growth of antitrust departments of German companies and employee trainings on compliance by the BASF were cited. Leniency programs that allow reduction of fines or even immunity under certain circumstances for parties that assist in investigating and prosecuting were also emphasized. Dr. U noted that this should be an important lesson to keep in mind when Philippine anti-cartel laws and policies are crafted. "the President of the Bundeskartellamt, Mr. Andreas Mundt, stated in the opening address that cartels do not stop at borders. Effective cartel prosecution is also an international task. This year’s International Conference on Competition would improve more cooperation among the competition authorities in the arena." Since it was noted that even large multinational firms were not exempt from the temptation to cartelize, sanctions must also be part of a two pronged approach to fighting cartels. Some lessons and principles in sanctioning that could be useful include taking into account cash flows of companies. European laws providing for imposing sanctions equivalent to 10% of global turnover (presumably the turnover resulting from cartelization activities) were also mentioned. In discussing the economic approach to requirements of proof in court, Dr. Fred Jenny, Chairman of the OECD Competition Committee mentioned that economics had an important role to play especially in helping to measure the impacts of cartel behaviour. Dr. Wolfgang Kirchhoff, a Judge at the German Federal Court of Justice, posed a challenge to economics when he noted that German courts rarely call on economics expertise though parties increasingly bring economic evidence to court. It was hinted that the problem may be that economists spoke in highly technical economic, mathematical and statistical terms that made it difficult for judges to understand their arguments. Economists apparently also have to help judges acquire an appreciation of economics. In conclusion, Dr. U noted that “Perhaps one could not help but have a heightened consciousness of the need for such a set of competition policy/anti-cartel laws and enforcement agency equivalent to the Bundeskartellamt in the Philippines these days. The conference certainly educated me on key features and structure for a future viable competition policy and anti-cartel agency in the country.” Dr. U attended the conference with the support of the Friedrich Naumann Foundation for Liberty (FNF). 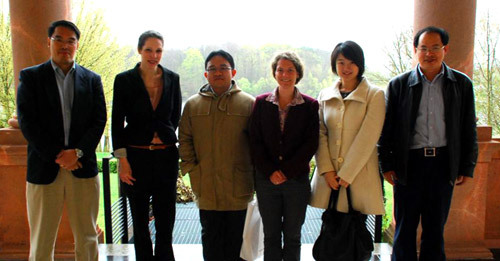 Held every other year and themed this year ‘A Spotlight on Cartel Prosecution,’ the conference was hosted by the BundesKartellamt last 14 – 15 April 2011. Dr. Peter Lee U is also the Vice-President of the Philippine Economic Society (PES). FNF Philippine Office partners with the PES in providing a venue for open and free discussions of economic policy issues and research findings through conferences, symposia and publications.